laid her down for good. she ran in her red Camaro. Her death—discarded in a lake. The lights left on for days. A television flashed and chattered. mummified on the kitchen counter. Cindy St. Onge is a multi-media poet whose video poems have been screened in video festivals in the US and Europe, and have been showcased at MovingPoems.com. Her poems have appeared recently in Timberline Review, Dappled Things, Right Hand Pointing, Gravel, Apeiron Review and other print and online journals. 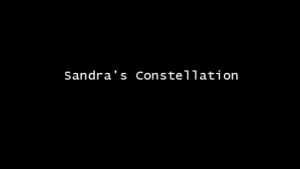 Sandra’s Constellation…” is anchored by the poem I wrote after seeing Werner Herzog’s documentary, “Into the Abyss,” specifically, it’s my reaction to the crime scene footage. The poem is my attempt to process the artifacts of Sandra Stotler’s last moments before she was shot twice by Michael Perry, in juxtaposition to the gruesome aftermath of her murder (October, 2001). The last stanza of the poem essentially describes the beginning of the crime scene tape, captured by Conroe law enforcement, as they walk into her home days after she’d been murdered, and her body discarded in a nearby lake. For the purpose of the film, and only for the film, I’ve changed the poetic text from “knock at the door” to “…doorbell rang.” The original “knock” is the official and correct text, as it’s part of the record of the Stotler case. I wanted a doorbell sound, because an audio of knocking is ambiguous, and might be mistaken for any number of noises. I wanted the doorbell, in it’s ironically sing-songy voice, to signal to the viewer/listener that this was the moment when Sandra was beckoned to her doom. I had originally planned to keep the word ‘knock’, but decided the incongruency may be distracting to the viewer, and opted to change the word for the video treatment.